Join expert Connie Lindsey, Head of Corporate Social Responsibility and Global Diversity & Inclusion at Northern Trust, as she leads a discussion around progressing talent recruitment, retention and managing to improve diversity and inclusion in the financial industry. Rethink industry hiring practices and explore how diversifying the workplace reshapes opportunity. 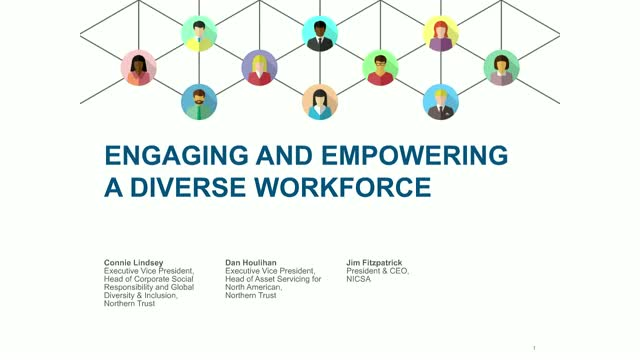 Listen to panelist Dan Houlihan, Head of Asset Servicing for North America, and Jim Fitzpatrick, President of NICSA, as they share more information about The Diversity Project North America, an organization dedicated to a more inclusive workforce culture. Enterprise blockchain has been touted as the "next big thing" for blockchain. However, implementing a new and often complex technology into a larger organisation has a number of obstacles that stand in the way of successful adoption and implementation. AI has the power to focus the volume of data in financial services. AI and machine learning tools can provide automated insights and analytics, giving asset owners and asset managers the ability to increase operational productivity, improve cybersecurity, and manage risk, among other benefits. Watch our latest AI webinar to learn about the current AI landscape, how AI in used in financial services, and the future state and what is to come with AI. Experts from the Technical Accounting Consulting team at Northern Trust discuss recent pronouncements (GASB 89, 88, 87), implementation guidance (Guides No. 2018-1 and 2017-3) and current GASB projects. How blockchain, AI and other technology has impacted the financial services industry and what else is to come. Ryan Ross speaks w/ Northern Trust's Anthony Stevens about how they are thinking about Blockchain, including seeking the right use case before creating a product, how users experience blockchain, why a distributed ledger was the product that fit a need, and how banks are working with regulatory bodies to streamline the industry, and how regulations will shape the industry. Join Northern Trust’s Dan Houlihan, Head of Global Fund Services, North America, and Peter Sanchez, CEO of Global Hedge Fund Services, and learn how we are strategizing about technology decisions to optimize innovation. Managing Risk in the Age of Cyber Threats. Investor priorities have shifted since the 2008 financial crisis, but one trend is clear: transparency has become paramount. As investor appetite for non-correlated assets grows apace, the volume and complexity of alternatives in their portfolios is burgeoning. In order to obtain a level of transparency similar to that available for their traditional long-only investments, they need to overcome the challenges of monitoring, valuing and reporting on this comparatively opaque and illiquid asset class. Steve Locke, Director of Security Technology at Northern Trust, shares insights on today’s cyber security landscape. In this session, he discusses trends in the cyber landscape, cyber attacks of 2017 and strategies for demystifying cyber threats. The U.S. market is large and can be very complex. Join our experts Barbara Nelligan, Head of Product Management – Global Fund Services North America and David Whitaker, President, Foreside as they provide a concise overview of the U.S. market. The final Department of Labor (DOL) Fiduciary Rule was released in April 2016, with an applicability date of April 10, 2017. The Rule redefines when a person becomes a fiduciary by providing investment advice related to retirement assets, including advice to ERISA plan fiduciaries, plan participants and IRA owners. In February, President Trump directed the DOL to re-examine the Rule. As a result, the DOL delayed the rule’s applicability date to June 9, 2017. Uncertainty remains about whether the Rule will be further delayed, modified or possibly even rescinded. Join us as we discuss the consequences and recent developments surrounding this Rule. There has been a great deal of interest in the financial services industry regarding Blockchain technology. Northern Trust sees the evolution of Blockchain as a potential opportunity to better serve clients through the faster settlement of certain transactions, an increased operational efficiency, increased efficiency through reduced capital and liquidity requirements, and greater transparency and security. Please join us for a discussion on Blockchain and its benefits. Join Northern Trust’s Don Rieck and Mercer’s Greg Korte for a knowledge share, as they discuss their experiences helping clients tackle these challenges. In particular, they’ll recommend how you can leverage other relationships to ease burdens and refocus efforts on core priorities. Join Northern Trust experts Kevin R. Blair and Domenic Sgambelluri as they discuss the background of T+2 Settlement, impacts, benefits, key considerations, fund-settlement cycle changes and Northern Trust’s response to this regulation. Liquidity is starting to become a significant issue for institutional investors. The impact of a difficult mix of market trends, a sustained low interest rate environment and the unintended consequences of certain regulations are all helping to make cash an increasingly problematic asset class to deal with. Whether seeing to obtain a return on your un-invested cash or liquidity to support investments, the environment is only likely to get more challenging. Northern Trust is a leading global provider of asset servicing and related services. We have experience helping some of the world’s largest and most complex organizations handle their asset servicing needs, offering guidance and insight with personalized service.